Many women find STOTT PILATES® to be one of best exercises to do, both during and after their pregnancy. One the top reasons STOTT PILATES® and pregnancy go together so well is that STOTT PILATES® is great at building core strength. If your abdominals, back, and pelvic floor/Kegel muscles are toned, they will support a more comfortable pregnancy and delivery. Pilates is also famous for helping new moms get their figures back after baby is born! Another great reason to practice the STOTT PILATES® Prenatal is that STOTT PILATES® is very adaptable and most exercises can be modified as your body and abilities change. How does pregnancy affect the stable core? During pregnancy, your tummy muscles are stretched over your growing baby and may weaken as a result. Your pelvic floor muscles are also placed under great stress and tend to stretch and move lower down into the pelvis under the weight of the baby. As a result, you may find it harder to contract these muscles and to hold them for very long. If your pelvic floor muscles are very weak, you may find that you are leaking urine when you cough or sneeze. If your tummy muscles are weak, you may have back or pelvic pain. During pregnancy, the hormone relaxin causes your ligaments to stretch more than normal and if you overload them further you may cause an injury. Is STOTT PILATES® useful during pregnancy? Because STOTT PILATES® targets the tummy and pelvic floor muscles and these muscles can weaken during pregnancy, STOTT PILATES® exercises can be useful. Many STOTT PILATES® exercies are performed on a “hands and knees” position, and this is an ideal position for pregnancy. It helps to take a lot of stress off your back and pelvis and towards the end of your pregnancy can help to position your baby ready for delivery. There are many benefits practicing the STOTT PILATES® Prenatal will allow you to stay fit and relaxed during this important time in your life. Learning the principles of centering, concentration, control, precision, breath, and flow will help you during your pregnancy and the birth of your baby. 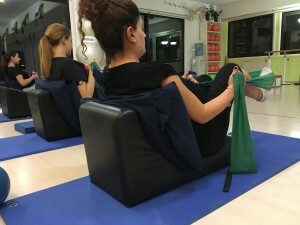 The practice of STOTT PILATES® during your pregnancy will also strengthen your abdominal, back, and pelvic muscles to assure that your pregnancy and labor are more comfortable. You will also be able to get back into shape faster after your delivery if you stay in shape during pregnancy with prenatal Pilates. The available information on pregnancy and exercise can be very confusing – even conflicting. 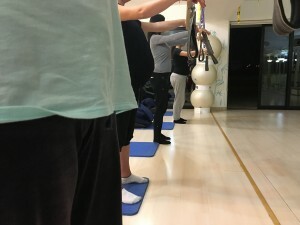 STOTT PILATES® follows the current standards practiced in the fitness industry regarding safety during pregnancy and the guidelines set out by professional organizations such as the American College of Obstetricians and Gynecologists and the Society of Obstetricians and Gynecologists of Canada. We cover this topic in depth in our Injuries & Special Populations course as well as workshops. What follows is some general information that should not be substituted for the advice of a physician and the guidance of a qualified fitness professional. No two women’s bodies are the same, and this is especially true during pregnancy. There are workouts that are quite appropriate for some people during pregnancy and not for others. During a normal, healthy pregnancy, moderate exercise is safe for the fetus. Exercise is also said to prevent varicose veins, hemorrhoids and low back pain and helps to boost self esteem, maintain fitness levels and prepare the body for the physical demands of motherhood. A woman’s body goes through many changes during pregnancy and exercise must be adapted and modified as the pregnancy progresses. The beauty of Pilates is that it can be individualized for anyone’s ability. Workouts and schedules during the first trimester may have to be adjusted around fatigue levels. Over the course of the pregnancy the demand on the abdominal muscles should be decreased. During the second trimester, these muscles become stretched out, and some women experience diastasis recti (separation of the abdominal muscles). With reduced abdominal support, there is a greater risk of injuring the lower back. Further, due to hormonal changes during pregnancy, the ligaments surrounding the joints become lax, leaving them loose and vulnerable. For this reason, you should be careful not to overstretch. It is important to continue strengthening and rebalancing the muscles around the joints – supporting the body as it goes through postural changes related to pregnancy. The first, and most important, thing for you to do before beginning your prenatal exercise plan is to get approval from your doctor. If you are going to take a class, you may be required to have a consent form signed by your doctor before being allowed to participate in the class. It is usually recommended that you should be at least 14 weeks pregnant before you begin a prenatal Pilates program. Once you begin your second trimester, exercises that require you to lay flat on your back are discouraged because this position can obstruct the flow of oxygen to your baby.